The most obvious difference is in the texture and visual look. in between stitches => very textured look, reminiscent of weaving, with alternating rows of stitches going over / under… Because you work in between stitches, the gap located between each stitch is approx. the same width as the post of a dc. The fabric is surprisingly soft and airy, moving easily despite the thickness of the fabric. Linked dc => what you’ll notice first about this stitch is how there is hardly any gap at all between the stitches. In fact, it’s hard to tell apart one stitch from the other.. or even one row from the other ! The resulting fabric is quite flat with rather discreet horizontal lines across. But it’s very dense and thick! Elongated dc => it’s quite surprising to notice how close visually this stitch is from dc in both loops. The only difference I can see is really that the elongated dc is… longer ! Thus the name ;-) But when touching it, the fabric also looks thinner and more drapy. As if the added chain stitch relaxed the fabric and added drape to it. When looking through a window, you can also see that the gap between stitches are much smaller than with dc in both loops. All in all, all this goes to show that this stitch does have its very own properties and is probably worth trying on a larger scale ! dc in both loops => width 10.1 cm – height 4.2 cm => Let’s use this as our reference measurements. Extended dc => Width 10.3 cm – height 5.7 cm => Extended dc is 2% larger et 36% taller than dc in both loops. Now, here are again some very interesting results ! dc in both loops => solid fabric. sturdy. does not stretch much vertically. In between stitches => thick fabric, yet surprisingly drapy. Limited stretch, both vertically and horizontally. Linked dc => hardly any drape at all. Limited stretch, although fabric does stretch a bit more vertically through the beginning of each row. Extended dc => promising drape, thin fabric. Stretches more horizontally. 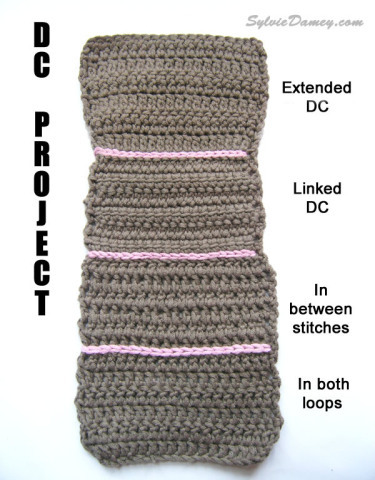 Linked dc => seeing how there is hardly any gap in between stitches, this variant of the double crochet could make perfect handbags or coin-purses: no more lost coins or little things through the stitches of a purse ! Extended dc => I really like the texture and thinness of this stitch, and would love to see the result when used in a garment. Maybe even try to work an extended dc in the front loop only ? Who will try this first ?